A subcategory in my collection are the souvenir piggy banks. Memories of a visit, a city trip, a holiday park, an entertainment centre, on the beach or the boulevard, you name it. In the 1920’s it was custom to bring home a souvenir. Travelling and holidays were only accessible to the happy few in that period of time. And one day a year for the common man’. With a souvenir one was a ‘traveler’, so it was an item for conversation. A variety of souvenirs were available in the tourist centers, most of them with a remarkable similarity: a photo on sticker/transfer of the ‘place to be’ on the souvenir. To put a transfer/ sticker on earthenware (cheaper than hand painted!) is relatively old. The transfer/ sticker is ‘glued’ on the bisquit piggy bank which is then glazed. Transfers often are a one-to-one copy of a picture postcard. 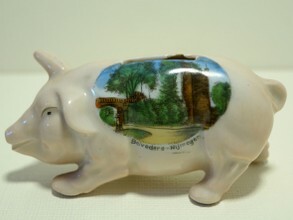 Knowing that it is not so difficult to identify the age of a souvenir piggy bank. Because a postcard has a postage stamp and date and/ or a written short message (often also with date) of the sender. Easy but the research, even with help of the internet, is time consuming. One has to find the exact picture postcard that matches the transfer. In most cases I scored 100%. 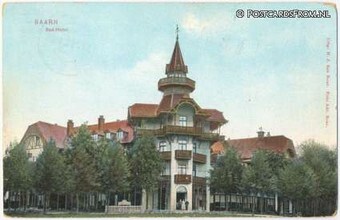 The shown picture postcard (source: Postcardsfrom.nl) dates from 1913. So I assume that the piggy bank is also produced in that period of time. It matches my assumption that these kind of souvenir piggy banks were ‘in fashion’ around 1920. 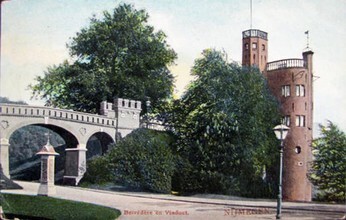 The shown transfer (Belvédère, Nijmegen) is a bad copy of the picture postcard (source: Verzamelaarsmarkt.nl) dated 1906. This specific type of piggy bank was, so it seems, a popular ‘seller’ in the souvenir shops. One could buy them in many cities and countries. 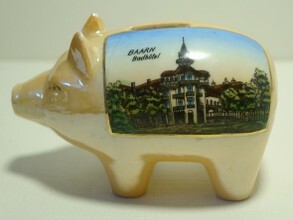 The production (piggy bank including transfer) however was in one country: Germany (most likely Thüringen).